Why do we love vintage things (well, rings, specifically) so much?!?!! One reason: they are so GD pretty. And they also have that timeless, storied look that you’ll want to tell people about for as long as that ring remains on your finger. I literally live for scrolling through my Instagram feed and double tapping all of the vintage styles I see. So, we thought we’d chat it out with one of our favorite brands, responsible for putting 💍💍💍 on the most discerning, vintage-loving brides out there. MiaDonna has an epic selection of conflict-free, lab-grown diamonds, that bring the antiqued aesthetic into modern times, without turning up the negative environmental and social impact [that Earth-mined diamonds do]. The majors at MiaDonna draw inspiration for their Engagement Rings and Wedding Ring Sets from a variety of solid sources. 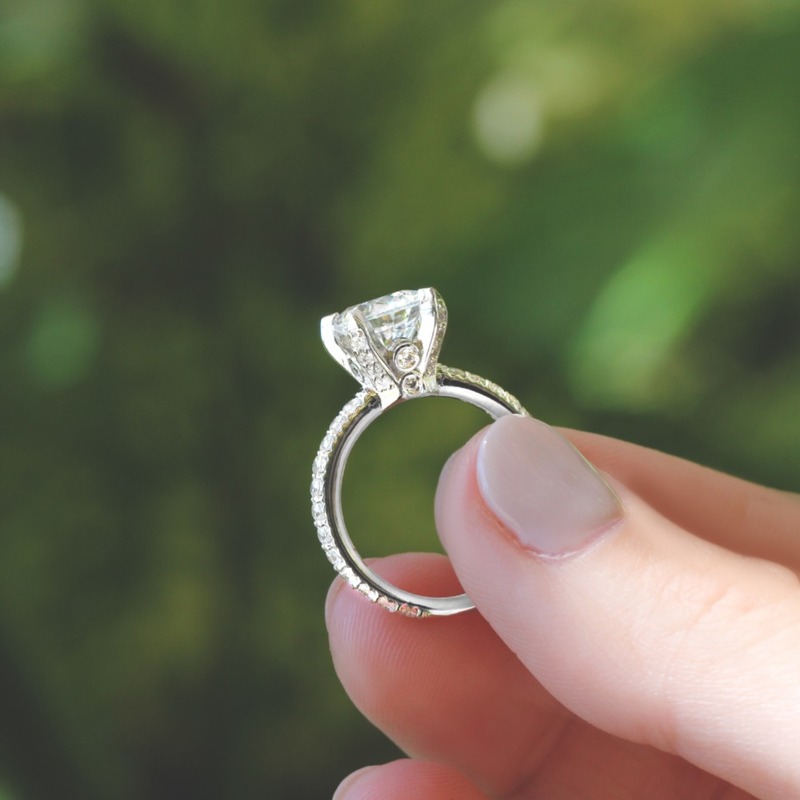 When dreaming up ideas for their Antique and Vintage-inspired designs, they look to past and present movies, celebrity engagement rings and fashion trends to lead the way. Their vision boards have pins from movies like The Great Gatsby, Breakfast at Tiffany’s, Gentlemen Prefer Blondes, Marie Antoinette and since-retired period television series like Mad Men and Pan Am. 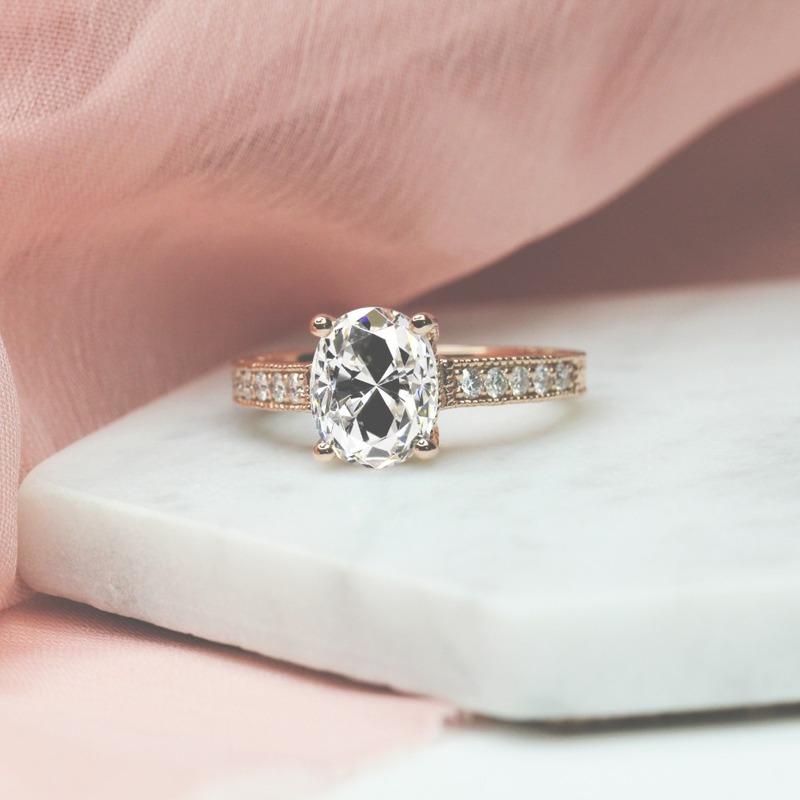 MiaDonna’s Founder, Anna-Mieke, and her design team have collaborated on rings inspired by the vintage details in Katie Holmes engagement ring from Tom Cruise, Katherine Heigl’s engagement ring from Josh Kelley and Miley Cyrus’s engagement ring from Liam Hemsworth. 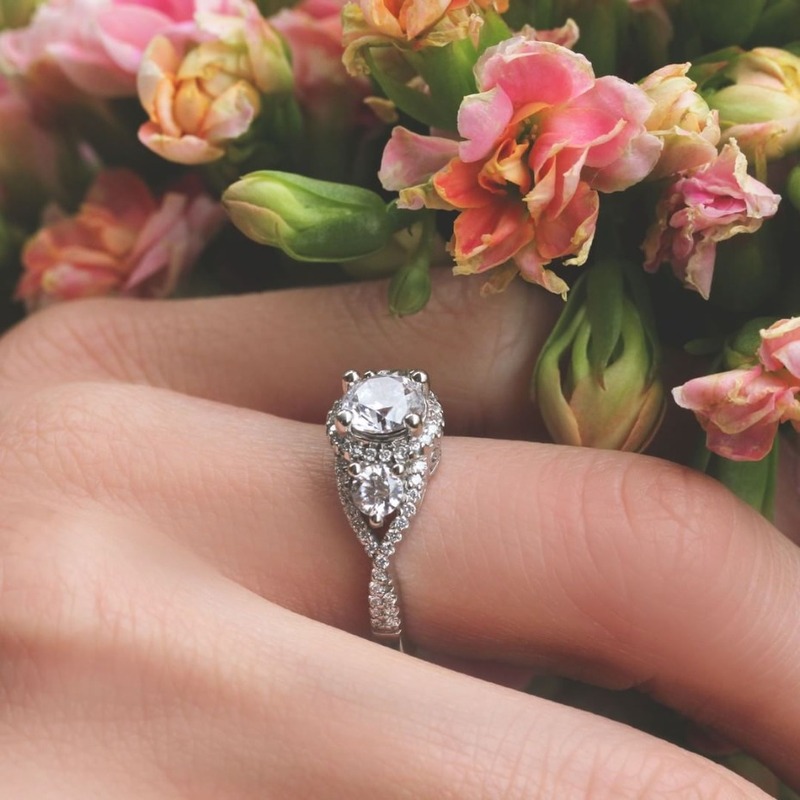 And the brand even sells a solitaire engagement ring that bears a striking resemblance to the antique engagement ring that Behati Prinsloo scored from Adam Levine. 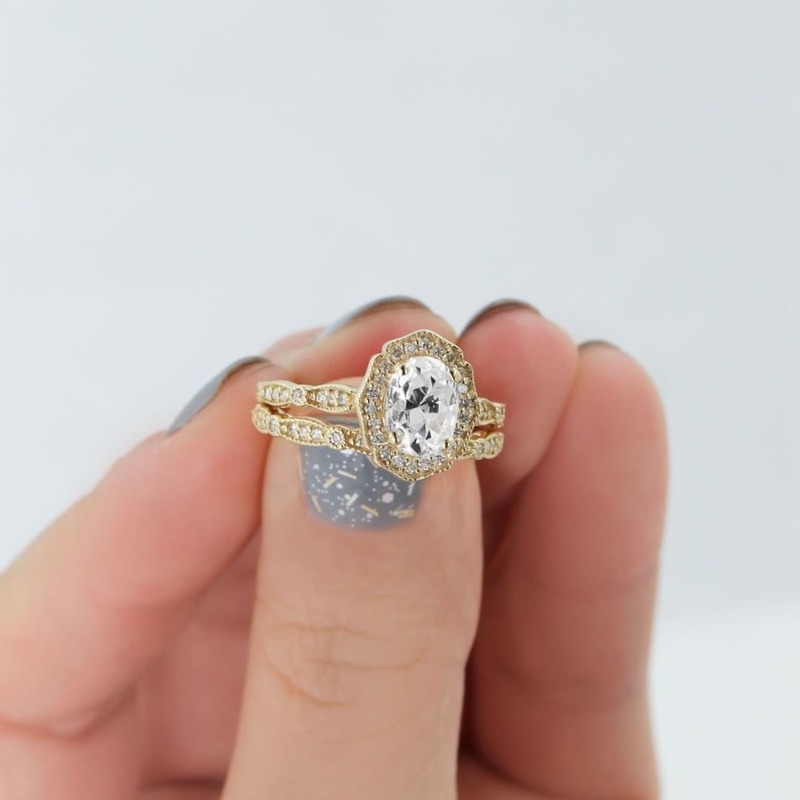 Scroll through to check out a few of our faves, and remember, with a vintage ring, it’ll look cool, they always look cool…. Just in case you needed some extra encouragement! 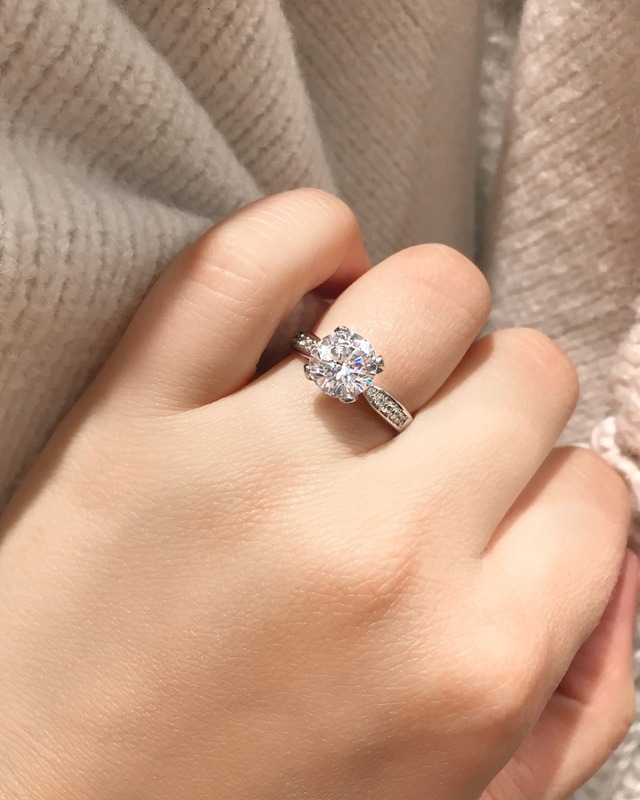 If a unique engagement ring is what you’re after, look no further than the Grace. 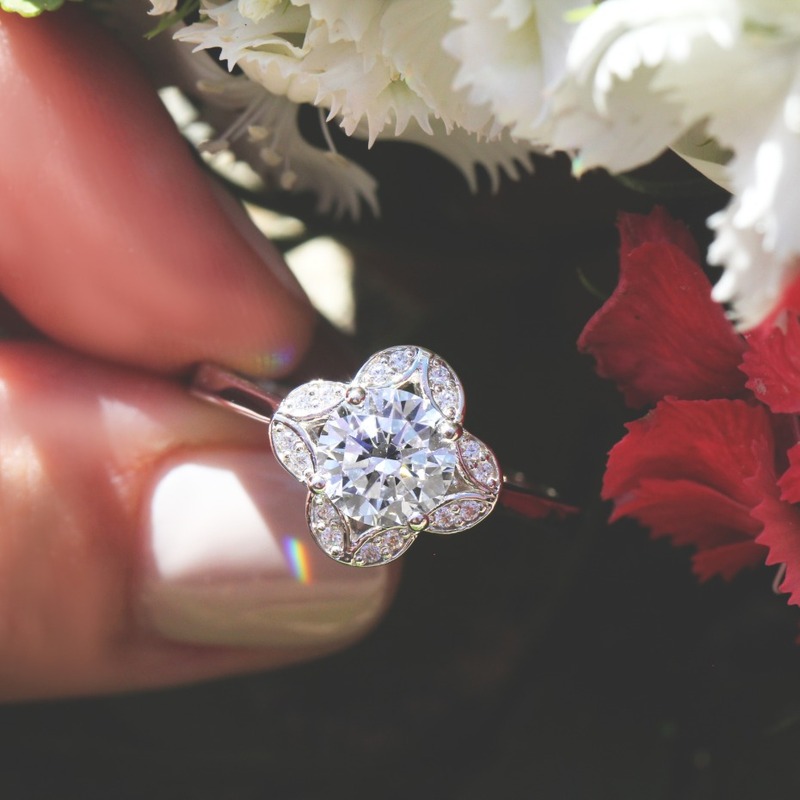 With clean lines and an uncommon flower design, this vintage style engagement ring is a definite beauty. 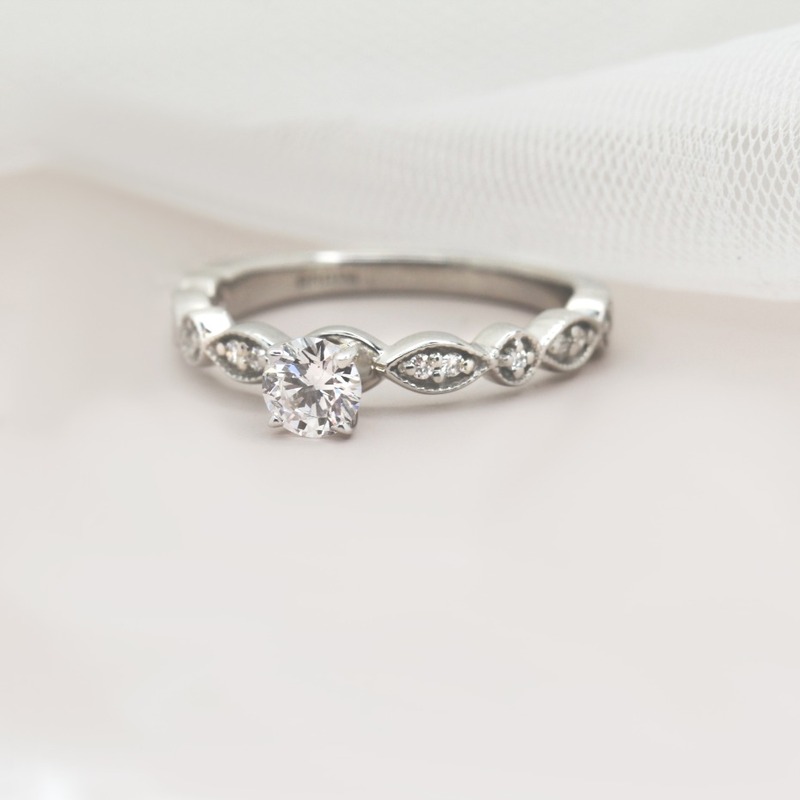 “Amore” is the perfect name for a ring we love so much! This delicate milgrained band with channel bead set natural-recycled diamonds can be stacked with other bands, so you can customize to your heart’s desire. This classic, diamond-accented band is truly fit for a Queen. Your choice of center stone is accented with bezel set stones intricately-placed between the ring’s four-prong head. This four-prong cathedral setting with channel set diamond side stones features a beautifully-engraved and beaded shank. What could be sweeter? A stunning round cut center stone held in a unique four-prong head with channel bead and bezel set diamonds to accent...what’s not to love about this detailed ring? Hand-carved filigree and 0.14 carats of natural side diamonds make the Ella the embodiment of classic beauty. 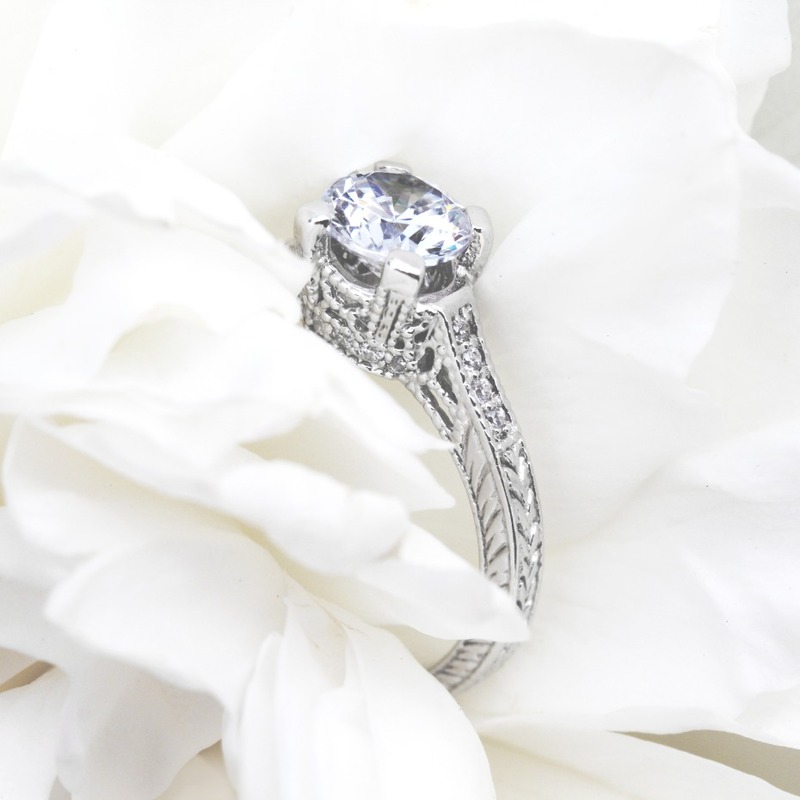 Modeled after Katherine Heigl’s engagement ring, the Katherine is a true showstopper. 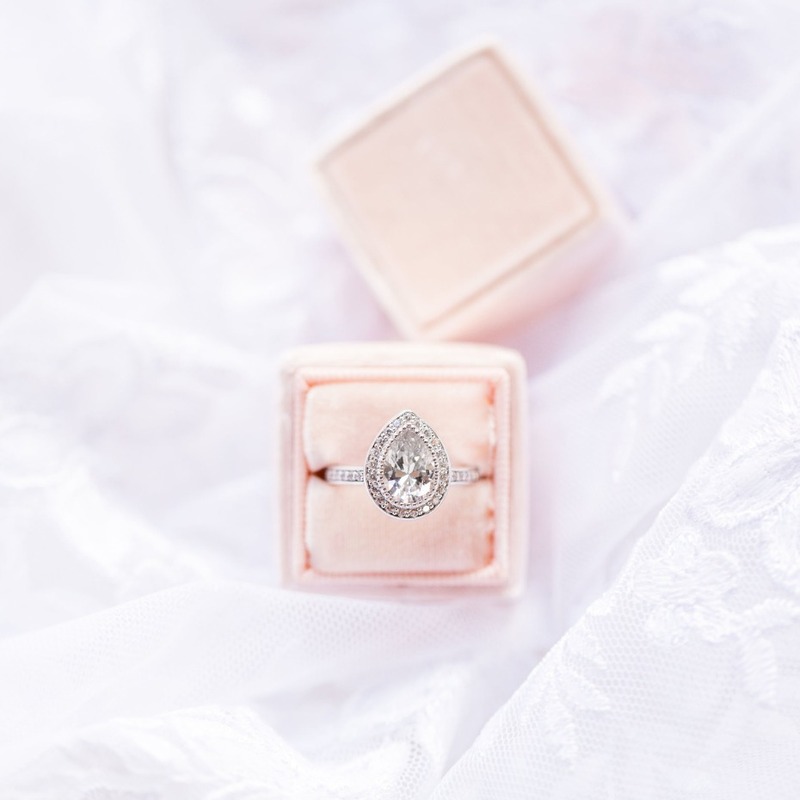 The ring’s French tip pear cut center stone is accented with a halo of diamonds and a band that boasts even more diamonds running down the shank. We partnered with MiaDonna to bring you all the details on their conflict-free campaign, headlined by a whole lot of vintage vibes. As always, thank you for supporting our sponsors!